I often joke about my trio of ne’er-do-well fairies: cleaning, cooking and laundry. The truth is, I struggle with maintaining our home. I can and do occasionally turn into a cleaning fool, and deep clean and organize to the nth degree. Our new home makes that a little easier to do, but even with more storage, my shoes wind up covering the floor of my closet (Mr. Official is truly thankful we no longer share a closet, I’m sure.) The daily mail may wind up in its designated spot, or somewhere on the kitchen table or island. And it might hang out there for a day or two or ten. Did you know? Dust bunnies multiply almost as fast as their real-life counterparts, especially under beds and couches and chairs. It’s a fact and I have the evidence to prove it. 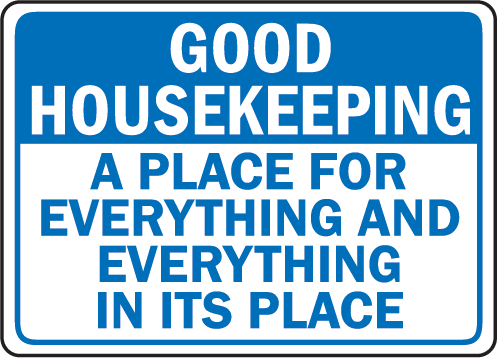 However, my view of housekeeping has evolved over time. In the beginning of our marriage, I viewed it as a chore to be delayed as long as possible, then I would dole out just enough of my precious time to get the job done. Done well, but not happily. Repeat as needed. Then I realized that while I didn’t like cleaning the house, I really do like having a clean house. For some enlightened people, that is the moment when a cleaning service enters their life. I salute them for making the obvious and wise choice; it’s just not in my nature to go that route. A few years ago, I decided to dig into what bugs me most about cleaning. I thought long and hard about which chore(s) I despised most, and why. Truthfully? No single chore fills me with dread. When I thought about it, I can’t say I hate any specific task, and some are pleasant..or at least it’s pleasant to step back and admire the results of some of them. So why the foot dragging? Mostly, I begrudge giving up time. Which is why I struggle with FlyLady’s method. 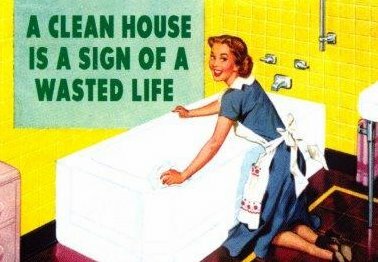 I’m all about cleaning my kitchen daily (and I thank her for the shiny sink routine), but I just can’t bring myself to stop everything and do a prescribed task each morning and evening. For starters, I am not convinced a bathroom is really clean after 15 minutes of effort. Nor can I do a whole-house blessing in an hour each week. I’ve tried, I’ve failed. More than once. And once I start, I’m sucked into a half-day cleaning marathon. I’d rather knock it all out at once, rather than do a bit here and there, and never feel my house is totally clean. Shrug. I know it works for some – just not for me. And so I spent most of Saturday catching up on housework I had postponed in favor of spring gardening and maintaining a schedule filled past capacity for the past several weeks. Mr. Official and Oldest Son made plans to head to my mother-in-law’s for yard work; my inner child would have preferred to tag along and be in or next to her pool for the day, but my dusty baseboards and baskets of unfolded clothes won out. I vacuumed, cleaned baseboards, mopped, caught up the laundry, dusted, cleaned our bathroom and the guest bath, and gave the kitchen a once-over, then headed to the store for a few groceries. By the time I was done, I still had some daylight to water the garden and play in the dirt for a bit. Not as refreshing as a day at the pool, but summer hasn’t officially begun yet, and there will be other days for that. So if you’re a housework dodger or hater, take heart. 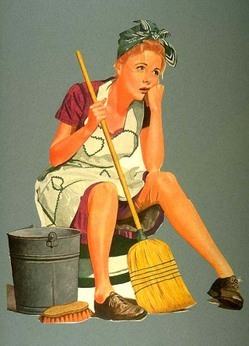 And take stock: ask yourself what you dislike about housework. Your honest appraisal may surprise you and start you on an evolutionary path as it did me. It alludes to how birds (and it’s probably the girl birds) who line their nest/home with feathers to create a comfortable and safe environment for their family. Most of us have been blessed with a home that is warm, safe, dry and comfortable. We have added furniture for seating, sleeping and eating; appliances to keep and prepare our food, wash and dry our clothes, and generally make our lives easier. Even the most humble American home or apartment is palatial when compared to how most of the world lives. 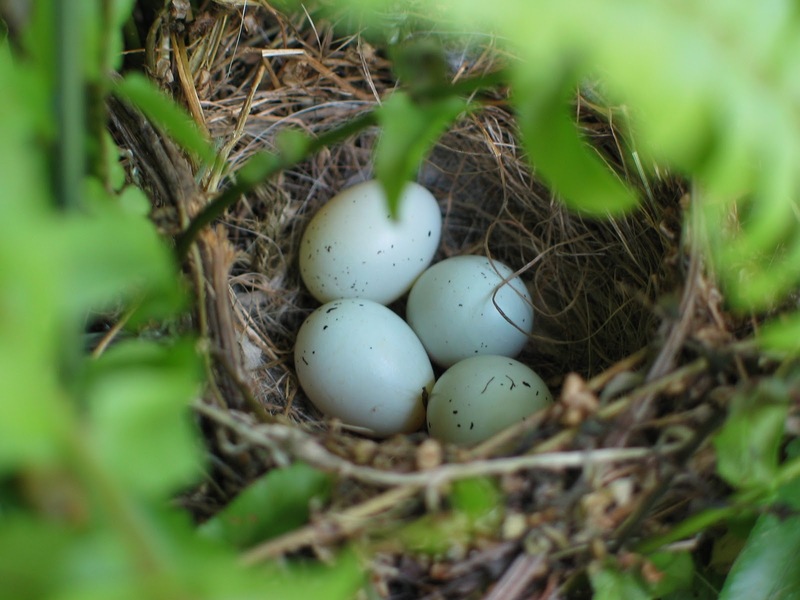 If birds are happy just to methodically gather up feathers to cushion their nests, why do we view taking care of our homes as menial work to be avoided as long as possible, and then done under duress? Don’t get me wrong – I’ve often viewed it that way too. And some tasks are not particularly pleasant, but if they’re done regularly, they really aren’t that gross or off-putting. On this particular day, I stripped the bed down to the mattress, tossed the mattress pad and blanket in the wash, rotated the mattress. While the laundry was going, I let some bleach work its wonders on the shower grout, cleaned the bathroom and then hopped in the shower to finish wiping it down and wash my hair. When the bedding was dry, I remade the bed and hung fresh towels. All-told my efforts took about an hour. When I was done, the bathroom sinks were shined and the toilet scrubbed (as they are each week); the baseboards were wiped down and all the shower crevices were bright and clean again, and the linens were all changed. Vacuuming and mopping had been done just a few days prior, so I skipped it. An hour to “feather my nest.” How can I view that as drudge work? Not like Peter Pan. Or R. Kelly’s song. Not even Elton John’s “Rocket Man” or Steppenwolf’s “Magic Carpet Ride” which are admittedly more generation-appropriate. No, this is FLY-ing, as in Flylady. For years I have heeded her basic admonition to shine my sink. It’s a habit that has stood me in good stead, and it really does influence how clean the rest of the house tends to stay. But other than my initial enthusiastic effort to embrace her neatnik ways, I haven’t really delved into the weekly flight plans with any regularity…and I’ve got some problem areas in the house that really need regular cleaning and organizing to make and keep them usable. I like her approach because she understands what makes us tick…why a lot of us will practically kill ourselves to super-clean our home, and then let it slide back into a state of unkempt-ness, almost overnight. Her methods are logical and won’t overwhelm us, no matter how bad our starting point is. If we consistently follow her tips and schedule, she will break us out of the clean/clutter cycle and get us to the point where we simply maintain a cleaner house, all. the. time. How great is that? Enough talking about it…I’m ready to FLY. Last week’s focus was on the kitchen, which was right up my alley. So from the grungy tops of the cabinets to the depths of the refrigerator and even that black hole known as “under the sink,” my kitchen is now much more cleaned, organized, and sanitized. 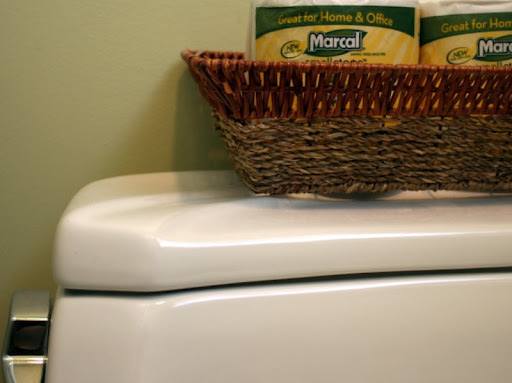 This week is bathroom and one extra room…guess it’s time to focus on the laundry room! If you haven’t checked out her website, it’s worth a little time to nose around in it. If you do, don’t be surprised if you find yourself shining your sink tonight. Not that kind, silly. This is a serious water closet conversation. I occasionally mention Flylady – in fact, I typically sing her praises. I think her ideas and routines are awesome. Wish I followed them all, but I don’t. (My sink is shined every night and those of you who know anything about her system will know what that means.) I embrace her general principles and salute her passion for helping us all become more organized and in control of our homes and lives. However, there is one area where Flylady and I aren’t on the same page: the toilet bowl. She advocates a daily swish-and-swipe of your bowl, using nothing more than a little soap (leftover shampoo or something similar) or just water from the toilet bowl itself. Kroger’s carried this brand for a while, but the last time I needed to stock up, I couldn’t find it. When I spotted a 48-roll pack at Staples for $16.99, I snagged it in a heartbeat. But I felt a little self-conscious lugging this ginormous package of TP from an office supply store. At least it will last us a while…maybe Kroger’s will have it in stock when I need to buy more? Sigh. I have whimpered and whined about my desk before. If you have read my blog this year, you’ve probably seen it. You’re probably tired of it. Even I am tired of listening to my own whining and whimpering. And yet I would rather blog about it than organize it. (An organized desk is NOT the sign of an empty mind or a wasted life, despite what the cutesy co-dependent sayings reassuringly tell me.) There’s very little danger of me becoming OCD about this. A messed up desk just means I waste a lot of time looking for stuff that is literally right under my nose. In my defense, I wear a lot of hats, juggle a lot of plates, choose your metaphor. I work from home, so there’s all the professional stuff that comes with the job. I volunteer in many areas of our children’s education and youth ministry, and there’s a lot of paperwork that comes with that territory. And I run a household, so there are bills to pay, statements to file, stuff to mail, etc. If that’s not enough, our school supply giveaway is in just over a week and that means all the last minute finishing details will need to be hammered out ASAP. I have envelopes with donations tucked in here and there. Eeek! The Secret Sisters cookbook is coming up (it will be our 4th annual) – it’s time to get the form ready and create a file for the returned recipes so I don’t lose any of them. I bought a new prayer journal yesterday and started on it…it needs to stay front and center or it will go by the wayside. Out of sight is out of mind. And then there are recipes…oh, so many recipes I want to try. Having a printer makes it easy to print them out…and there they lay until I can get them to the kitchen for a test drive. The fact is, I can rationalize and justify this all I want but I need to get a better system and process for dealing with the paperwork that swamps the desk, spills over onto the credenza, the chair behind me, the floor…basically any flat surface within arm’s reach. My life is stuffed full of really good stuff. It’s time to make a place for everything, and return everything to its place when I’m changing gears. So today I am literally taking everything off and out of the desk and everywhere else it’s stacked, and I’m shredding and filing and organizing. Just as soon as I post this. Okay enough blogging, time to start. If you don’t hear from me by Monday, somebody call a family member to check on me, please? The poor Alberta Spruce. If only it knew its fate before I placed it in my cart at The Home Depot today. It probably would have toppled itself over, broken off the main stem and gotten it over with right then and there. Instead, it’s now home, planted and facing the distinct possibility of a slow, torturous death. But let’s back up to the beginning. Two years ago, I cajoled my dad, my mom, my husband and one of my sons into creating a new sidewalk, down the side of our just-finished garage (no more carport – yay!) and also extending out to encircle our big honkin’ Magnolia tree. It isn’t quite a perfect axis from tree trunk to my kitchen window overlooking the backyard, but the tree is 40 feet tall and the window isn’t going anywhere. It’s close enough. We just about killed ourselves creating the sidewalk, but in the final analysis, it’s been a really nice addition to the landscaping. 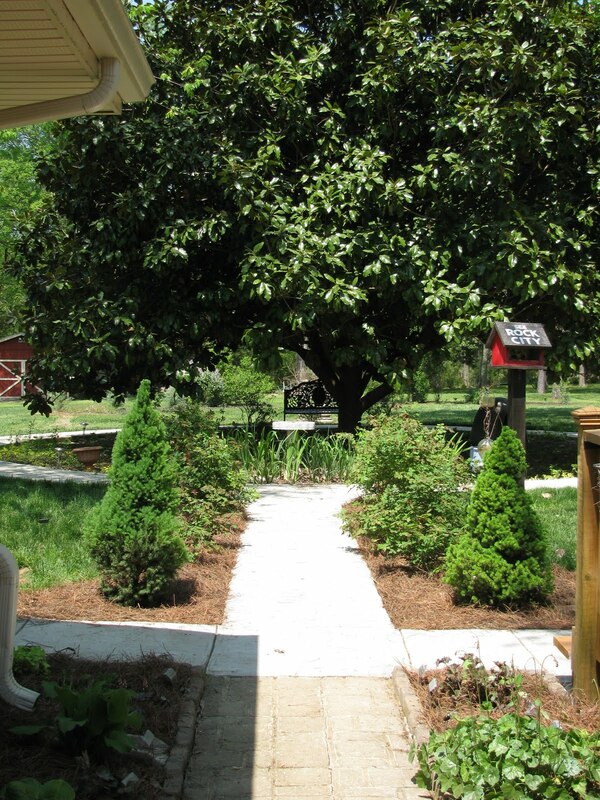 As soon as the sidewalk was done, we eagerly put in landscape edging and created symmetrical rose beds to flank this walk. Knockout roses in red and pink create perfect formal symmetry along this walk…at least in my mind’s eye. I also bought two Alberta Spruce to set at the entrance to this walk. One has survived nicely, while the other one died, and was replaced, and replaced again…and now again. Truth be told, the left side of the bed gets a bit soggy if we get a lot of rain – the ground slopes that direction and the sidewalk creates a barrier, so it pools and puddles. And we are prone to get monsoon-esque rains every now and again here in the south. If not in the spring, then in the fall when hurricanes rip up the coastline, they also move in enough to bring us a deluge…sometimes they last for days. So the plants on the left side of the bed have suffered a bit: the roses are not quite as big as half the size of their counterparts across the sidewalk. And the righthand side Alberta Spruce has had three (now four) mates in two years. Lesser mortals would give up. But I have decided I can outwit and overcome nature. Sheer force of will and all that. I spent time mounding up the soil under the roses on that side, so they are held a little higher. Fresh soil and lots of soil conditioner is now holding this Alberta Spruce aloft. And if all else fails, I’m saving the tag and receipt – I can always try with a fifth one. When I finished planting the poor new spruce, I adapted this Flylady recipe for garlic lime chicken to make butterflied pork cutlets – yummy. (Yes, they were on the weekly menu for yesterday, but my family went AWOL at dinner time last night. Husband went to an investors meeting in Brentwood, daughter attended an Anatomy & Physiology class at MTSU with a friend (her first exposure to college life); and half my male progeny wanted to take advantage of cheap eats night at Kirkenburt’s Smokehouse Grill. I wasn’t about to cast pearls before absent swine, so the other son and I rustled up some burgers and I saved the dish for tonight – it got rave reviews. Thanks to the Recipes forum at Dave’s Garden for turning me onto this awesome, fast recipe. Speaking of pellets, the cat managed to rip open one of her krinkly “Kong” toys from Christmas, and spewed little pellets everywhere she carried the poor dead remains before we could stop her. Guess it’s a good thing Flylady is focusing on the living areas this week…something tells me that Dyson and I will be busy playing pickup all week. But back to the topic of snow. Our youth group is preparing for its annual pilgrimage to Perfect North in Lawrenceburg, Indiana for a weekend of snowy fun: tubing, boarding, or skiing – it’s all there for us to enjoy. Of course, colder temps and more white stuff coming down from the sky means less manufactured snow and fewer icy patches to contend with on the slopes. So we’ll keep our fingers crossed this week for some snowy days here–and in Indiana. To continue my really random word association: Indiana. Home of the Colts, and to our own beloved UT alum and adopted Tennessee son, Peyton Manning. We’ll be rooting for you on the 7th! That’s also the day our congregation is holding a SOUP’R Sunday – we’ll help restock our food pantry with donated items, and entice members to stay for lunch with a variety of warm and yummy soups while they check out the various service opportunities they can volunteer to help with in 2010. Then we’ll all have the evening free to watch Super Bowl XLIV (or 44 for those who have forgotten their Roman numerals.) Definitely a day to look forward to – please come join us if you’re in the neighborhood.